Let my words be written so that you of the future may know the true power of the Force. Before the universe began there existed only chaos. When Chaos ruled, that what we now call the Force was not present. Chaos is neither good or evil it just is. When the universe came into being it was through Chaos that it was created just as the Force. Chaos determined how the Force interacts with all that is part of the universe. In time the universe became stable and Chaos was lost, the matter in the universe became the planets and the stars. The Force settled into all the matter that existed, both seen and unseen. When life began it was unable to draw upon the Force, which bound it to everything else in the universe. In time this changed beings began to sense the Force and use it. There came a time when beings learned to use the Force, the were called Jedi. Their philosophy was to use the Force to help those less fortunate, never to use the Force for their own benefit. By doing this the Jedi only use one half of the Force, this limited their potential. If it were left to the Jedi the knowledge of Chaos would never have been found. Soon some of those Jedi became discontent with the Jedi way. They set out on a new path of discovery, they began to experiment with the Force. These Jedi were the founders of the Sith. The word Sith means chaos, these Dark Jedi learned that they could use the Force to gain access to the fundamental force of creation called CHAOS. The use of Chaos can be very dangerous, for it's power is cumbersome. Any who attempt to use it must be willing to suffer the consequences of their actions, including their own death. To ever have any real success in using Chaos the user must be skilled in the use of the Dark and Light Sides of the Force. One of the most very simple uses of Chaos is the ablility to shatter the soul of another being. This is accomplished by focusing on the frequency at which the soul vibrates in the Force. At the most fundamental levels of matter Chaos still exists in some small part. When the user has focused in on the soul's frequency, the user must consentrate his anger on what he wants to effect. This is the dangerous part, if the user does not have full consentration on the aspect of Chaos that he wants to effect the user may unintentionally use the Force to nudge the wrong aspect of Chaos. In doing so any number of thing could happen including the destruction of a solar system. If the user has focused in on the right aspect of Chaos he may then nudge it with the Force, in doing this the user is ineffect changing the reality of the universe in that localized area. The soul is not actually destroyed for this is not possible, the soul is shattered it is knocked into another reality. Only a very skilled user of Chaos can determine the place the soul is banished to. Another use of Chaos it to destroy matter. Just as before the user must focus in on the frequency of the object he wants to effect, the only diffrence is the aspect the user will effect with the Force. In this case the user will effect the aspect of subatomic bonds, the user must use the Force to feel his way through this intricate disorder to find this aspect. With use the user will be able to navigate their way through Chaos with relative ease. But you must be warned the use of Chaos is different every time, a path used before may not be the same the next time you use it for this is also the way of Chaos. As it is written so it is. once was again. The Sith shall return as it always has this is our destiny. 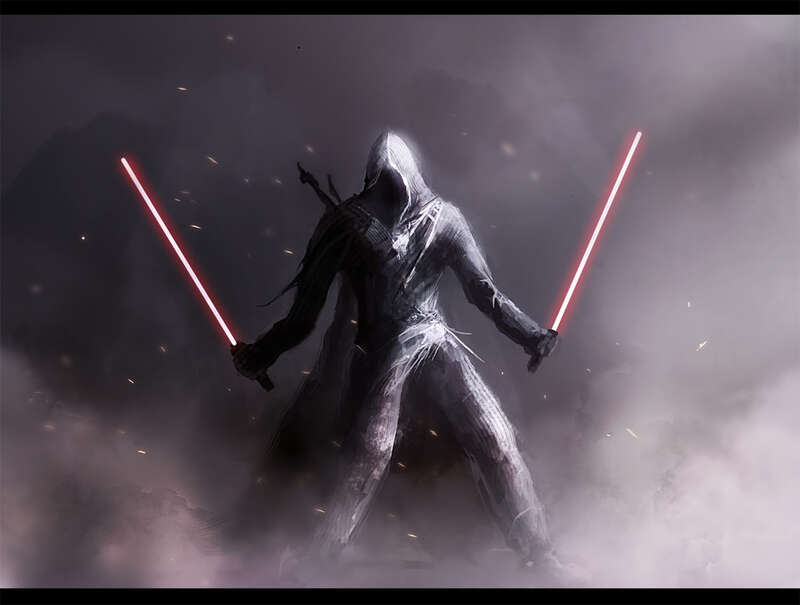 The Sith began with the first Jedi. Unknown to them there was always those that sought the knowledge for self gain. It is our nature to use our power for our own benefit. The pathetic Jedi deny this and seek to destroy us of the Sith for our knowledge. There has been many times in the past when the Jedi have eradicated most of us, but their only needs to be one of us left to pass on the knowledge we have gained. The first great rise of the Sith came about with the Jedi Ninurta Istaran he was the first to discover Chaos. He turned away from his master's teaching and went forth to learn the Force on his own. He journeyed to a world which name has been lost in time. There he spent many years learning the Dark Side of the Force, and focusing his anger. The first great find was Chaos, with this he was able to make all bow before him. This knowledge helped him become the first Dark Lord of the Sith, it is to him we of the Sith owe a debt of gratitude. With the foundation of the Sith he set forth to create a Empire to consume the entire galaxy in darkness. Istaran succeeded in capturing a 1/4 of the galaxy. At this time the Jedi Council met to discuss destroying him and his followers. A war ensued for ten years, in the end the Jedi won due to their large numbers. Istaran consolidated his forces and found a world to create a sanctuary for himself. There he finished out his years and passed down his knowledge. Unknown to the Jedi much was learned of the Dark Side during this time because of the war. The next great rise of the Sith came about not because of a Dark Lord but because of his first apprentice Naga Sadow. Unknown to his Dark Lord Sadow set out to create his own Empire. As his power grew so did his Empire. Soon his Dark Lord found out that Sadow had deceived him and was planning to overthrow him. Sadow was forced to flee from his Dark Lord and go into hiding. The Republic sent a fleet to find and eradicate him because he had taken many of their worlds. 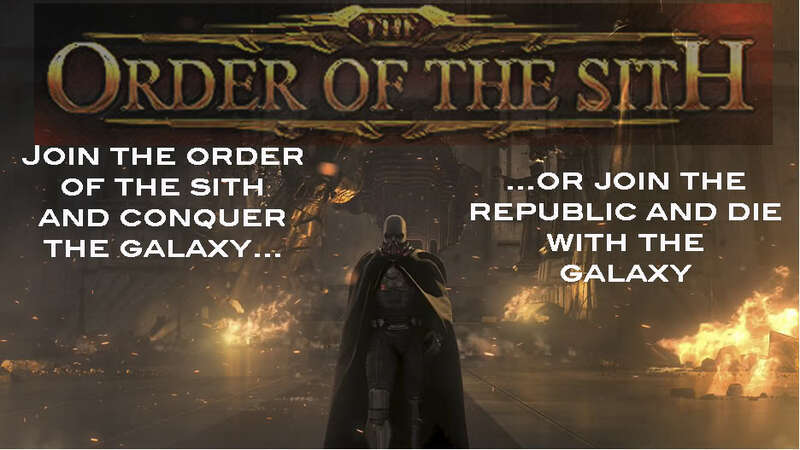 Sadow was forced to give up his small Empire and hide in the Outer Rim. On his way to the Outer Rim a Republic fleet found him, he was then forced to destroy a star system to escape. The world he found to hide on was called Yavin Four. There he set up a kingdom and ruled over the Massassi people. For a thousands years the Sith did not become a major factor in the galaxy. Not until the time of Exar Kun. Exar was a very great student of the Force but he felt there was more to learn. He began to study the Dark Side but his master forbid him from studying it any more we he found out. Exar did not listen to his master and set off to learn the Dark Side. He went to the world called Onderon in search of Dark Side knowledge. With the help of some Darksiders he found the tomb of Freedon Nad. When he entered the tomb Nad's spirit awaited him. Nad told him to take the scroll from under his now dead body. The scrolls told Kun of the last resting place of the Dark Lords. The world was Korribun, Exar journeyed to Korribun to meet Freedon Nad. There Nad led him to the Temple of the Dark Lords, Exar was forced to battle enslaved spirits. To escape Nad told him to enter the temple. In the temple Nad shattered the bones of Kun and forced him to submit to the Dark Side. After many agonizing hours Exar gave in and agreed to accept the Dark Side. Inturn Nad healed him and showed him all that was in the temple. Exar then when to Yavin Four to learn more of the Dark Side. On Yavin the Massassi captured him and threw him into a pit with a beast. Nad told him to focus his anger through the amulet the Massassi possessed. For the first time Exar knew the full potential of the Dark Side. He destroyed to beast and then turned on Nad and destroyed him. The Massassi became his slaves and helped him leave Yavin Four. Kun then sought out the other students of Freedon Nad. His search brought him to the Empress Teta system. There he found the other students. In a battle with Ulic Qel-Droma, the Dark lord of the Sith Istaran granted him the Title of Dark Lord of the Sith. Ulic became his First Apprentice. For Many years the two brought darkness to the Republic worlds. But because of the weak nature of Ulic he betrayed Exar to the Jedi and they found Exar and turned him to stone. The rise of Exar was not complete for some time from now he shall rise from his stone prison to retake the galaxy. The future is now what I see. I see the rise of a great Sith Lord, he shall be called Dark Lord of the Sith. But this is not so, for it was not granted to the one called Vader. This one called Sith Lord shall rule all the galaxy.